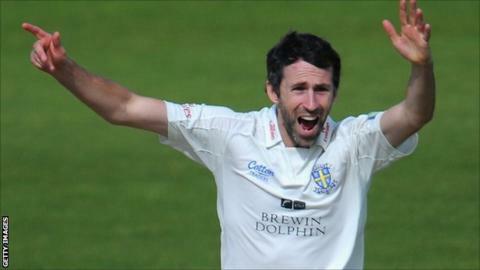 Durham seamer Graham Onions has signed a two-year contract extension that commits him to the club until 2017. The 31-year-old made his first-class debut in 2004 and has been part of the county's 2008, 2009 and 2013 Championship title victories. Onions, who has also played nine Tests for England, was voted last season's Championship Player of the Year. "I still get an enormous sense of pride playing for my local county," the Gateshead-born paceman said. "With the crop of young players coming through, I'm confident we can have lots of success in the future." Onions was the leading wicket-taker in Division One last season with 70 victims in 12 matches, and has 447 wickets in total in first-class cricket.